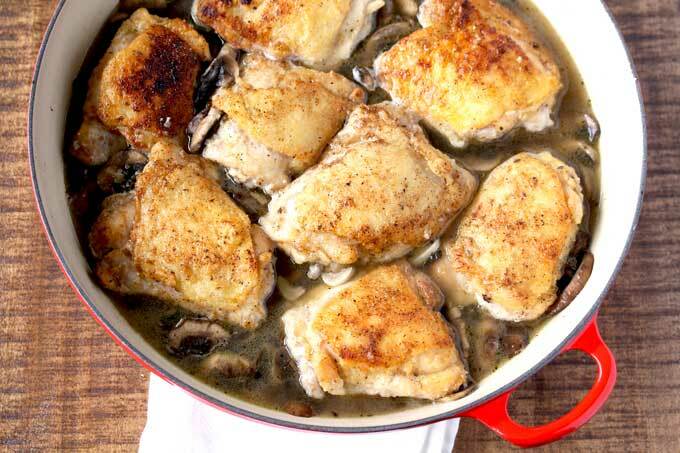 This Creamy Chicken and Mushrooms recipe is easy and delicious. Bone-in chicken thighs are pan roasted and smothered in the most delectable creamy mushroom sauce made from scratch (no cream of mushroom soup here!). A simple yet elegant meal perfect for company but also great any day of the week! I always have bone-in chicken thighs in my freezer. They are always on sale at the market and they have so much more flavor than chicken breasts. 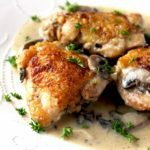 One of the things I love about this creamy chicken and mushroom recipe is that is made in one-skillet. No need to get multiple pots and pans dirty. That is always a plus for me as I always end up doing the cooking and the dishes. 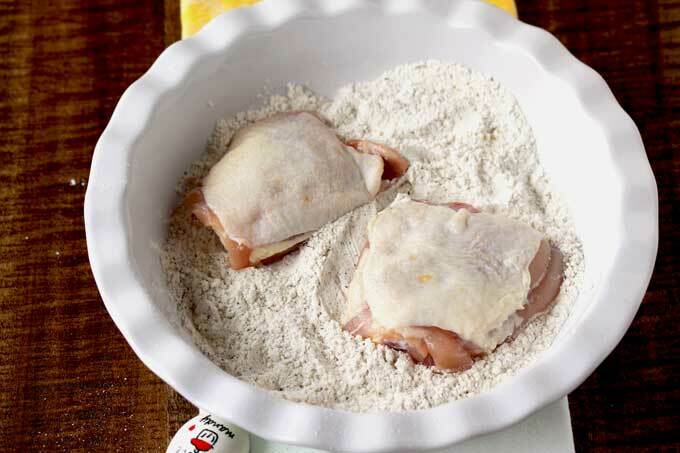 Place the skillet in the oven and bake for about 30 – 35 minutes or until the chicken is cooked through. The chicken should reach an internal temperature of 165 degrees. I always pat dry my chicken to make sure I get a nice brown crispy skin. Season the chicken thighs with salt on both sides. 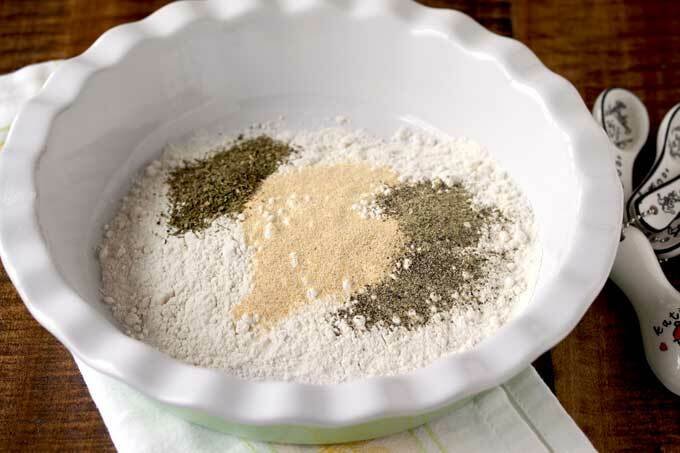 Mix the flour and spices in a shallow bowl. Dredge the chicken, piece by piece in the flour mixture. Heat the oil in a large heavy skillet and cook the chicken skin side down first. You don’t want to over crowd the skillet. Cook the chicken in batches or you risk ending up with steamed chicken instead of a having crispy golden-brown chicken. Flip the chicken and cook the other side for about 3 – 4 minutes. Remove the chicken to a plate. Repeat until all the chicken is brown, adding extra oil if needed. 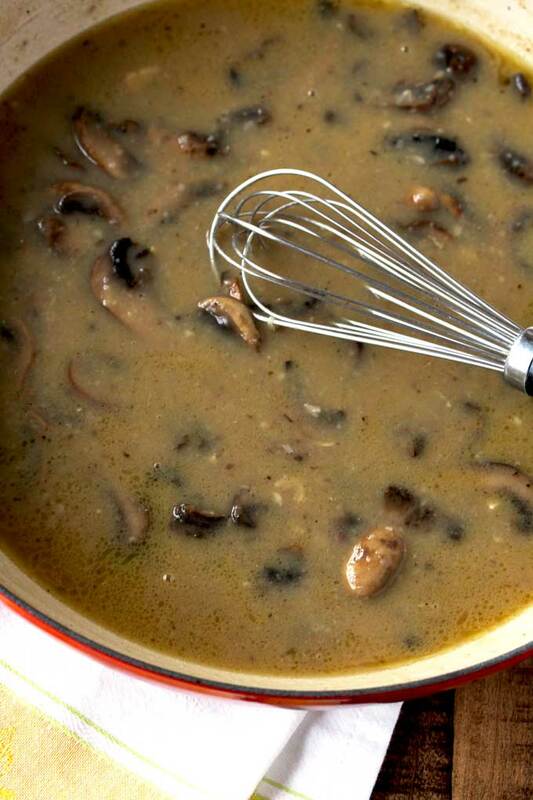 To make the creamy mushroom sauce, melt the butter into the same skillet and add the mushrooms and garlic. Cook, stirring frequently for about 5 minutes. The mushrooms will soften and get a bit golden on the edges. Add the wine and bring to a boil. With a wooden spoon scrape the brown bits from the bottom of the skillet – that is concentrated flavor right there. Add the chicken stock and salt and bring to a simmer. Return the chicken to the skillet, cover and bake. 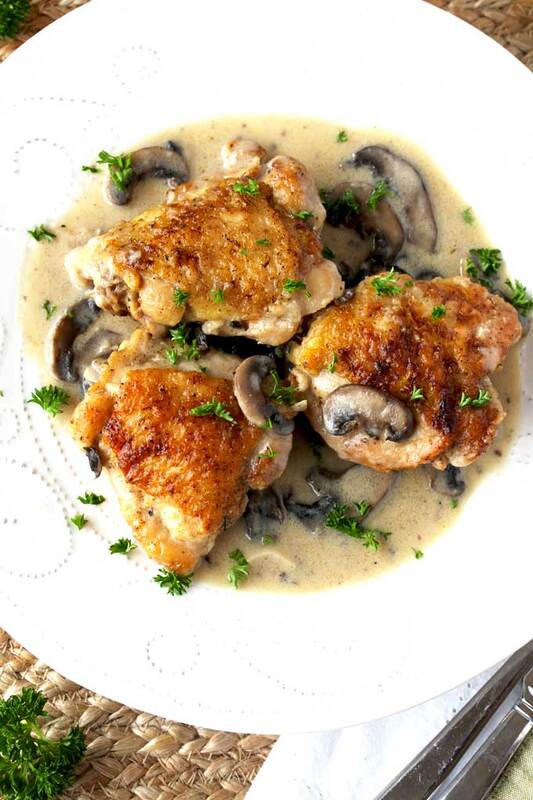 (Check exact times on the creamy chicken and mushrooms recipe below). Remove the skillet from the oven. It’s time to finish the mushroom sauce! Remove the chicken from the skillet. With a fork, mash butter and flour together and add it to the skillet. This mixture will thickened the sauce. Simmer for a few minutes and then stir in the cream – yes, cream! if you are feeling guilty already, you can use Half & Half but – it’s only 1/4 cup of cream so let’s live a little! After a quick simmer, I put the chicken back into the skillet and I am ready to eat! 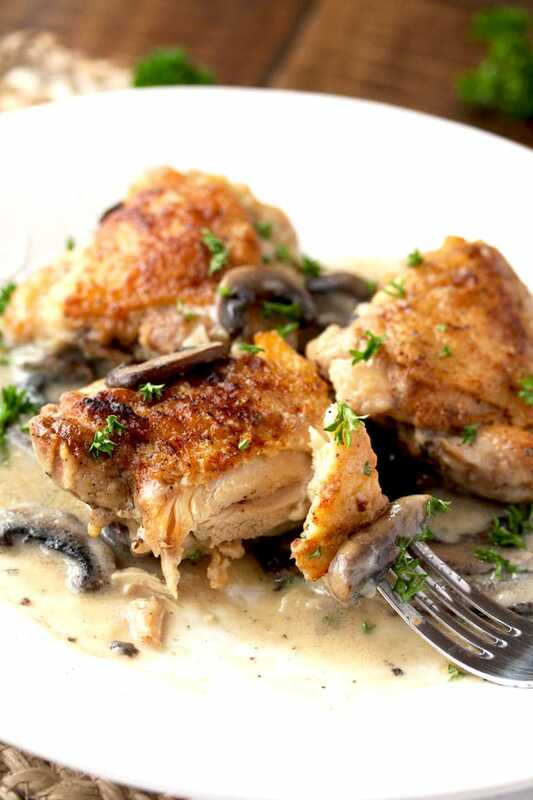 Golden brown and juicy chicken thighs smothered in mouthwatering and decadent creamy mushroom sauce – yes please! 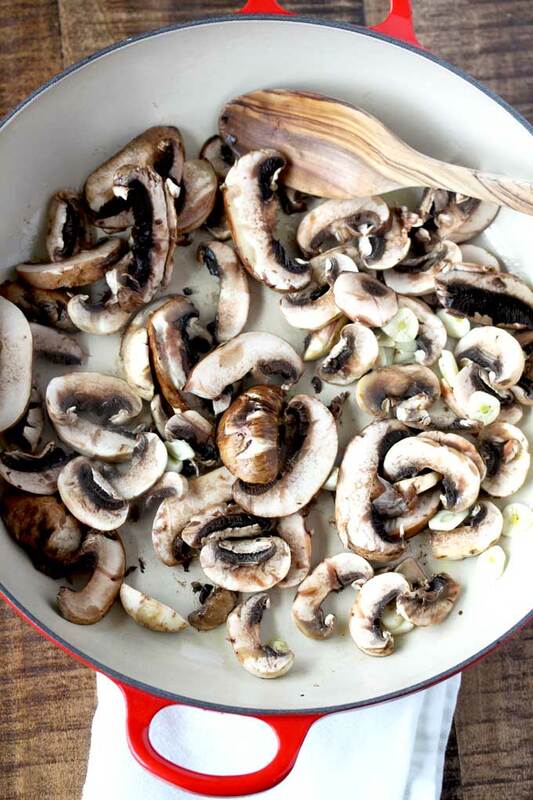 You can use white button mushrooms, creminis, mini bellas or a combination of them. Love chicken thighs? 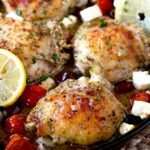 Check out this tasty Lemon and Herb Roasted Chicken Thighs. If you want to make this dish gluten free, use GF flour. Serve this Creamy Chicken and Mushrooms with Garlic Mashed Potatoes in the Slow Cooker. 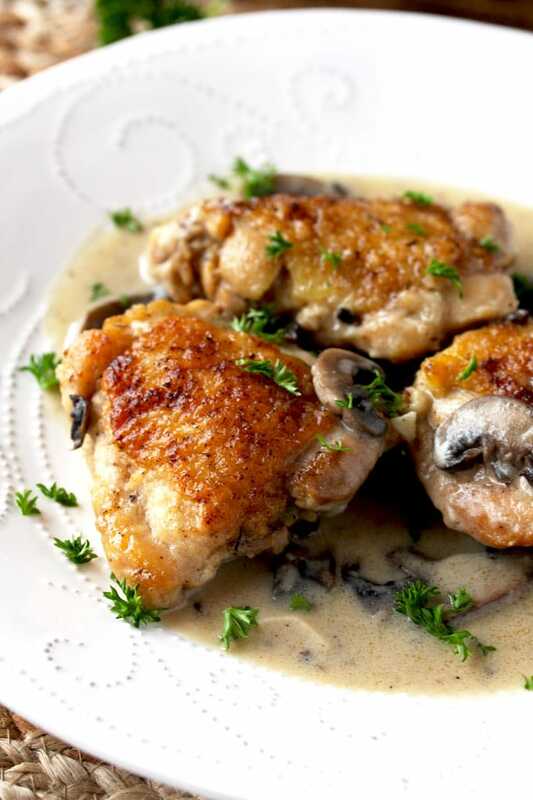 WANT TO TRY THIS CREAMY CHICKEN AND MUSHROOMS RECIPE? PIN IT TO YOUR CHICKEN OR MAIN DISH BOARD!! This Creamy Chicken and Mushrooms recipe is easy and delicious. Bone in chicken thighs are pan roasted and smothered in the most delectable creamy mushroom sauce made from scratch (no cream of mushroom soup here!). A simple yet elegant meal perfect for company. Pat the chicken dry with paper towels. Season the chicken pieces with salt on both sides. In a medium shallow bowl, mix together the flour, garlic powder, ground black pepper and Italian seasoning. Dredge the chicken in the flour mixture one by one. Heat the oil in a large heavy skillet over medium-high heat. Brown the chicken skin side down first for about 4-5 minutes or until golden brown. Flip the chicken and brown the other side for about 3 minutes. Remove the chicken to a plate. You may need to do this in batches not to overcrowd the skillet. Continue until all the chicken is browned adding extra oil if needed. In the same skillet melt the butter and add the mushrooms and garlic. Cook stirring occasionally for about 5 minutes or until the mushrooms look soft and a bit golden. Add the white wine and bring to a boil. Cook for about 2 minutes scraping the brown bits from the bottom of the skillet. Add the chicken stock and salt and bring to a simmer. Return the chicken to the skillet and cover. Bake for about 30 - 35 minutes or until the chicken is cooked through (internal temperature should reach 165 degrees on an instant-read thermometer). Remove from the oven. Remove the chicken to a plate. 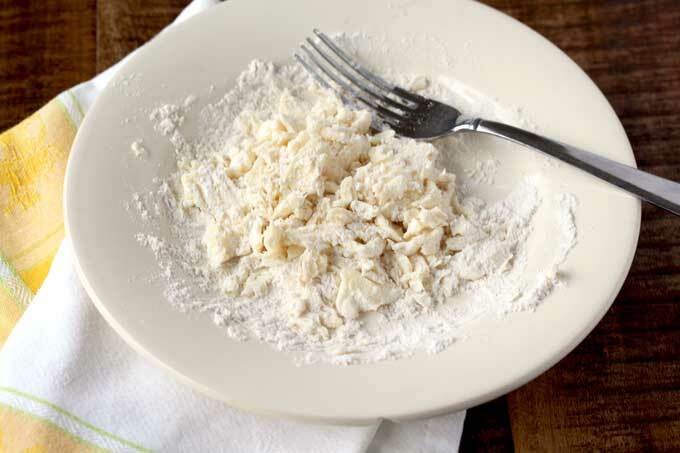 With a fork, mash the remaining 2 tablespoons of butter with the 2 tablespoons of flour. Add the mixture to the skillet and simmer stirring frequently over medium-low heat for about 4 minutes. Stir in the cream and simmer for about 2 more minutes. Adjust seasoning to your taste. Return the chicken to the pan. Serve hot. I always have chicken thighs in the freezer too. They are so great….and this recipe sounds delicious. That creamy mushroom sauce over some mashed potatoes. Pour me a glass of wine and call it dinner. Perfect for any night of the week, and worthy enough for company too. Thank you!!! I like how you think Gloria! Chicken thighs are so good! These look like they are cooked perfectly. And the mushroom cream sauce? Yum! And only one pan is a huge plus! Such a great and classic combo! This sounds like such a great and hearty meal for a weeknight. Gotta love these one pot meals, yum! I have a hard time finding bone-in, skin-on chicken thighs sometimes so when I do find them, I stock up a little and just keep it in the freezer. This recipe looks fantastic, I think mushrooms and wine were meant to be together. I find they really compliment each other. Thanks for sharing your recipes. Girl, this gorgeous sauce has my heart! Gimme allllll the mushrooms! And seriously, bone-in chicken thighs in the skillet are amazeballs. Love this recipe! 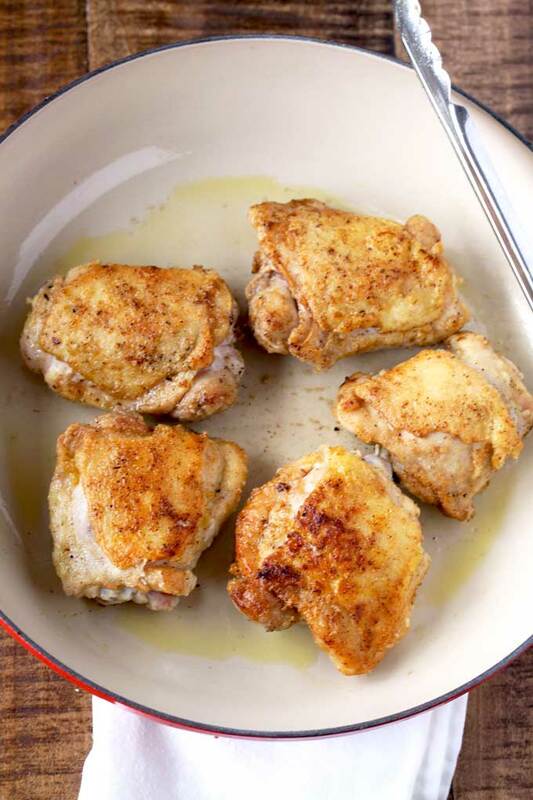 Look at the crispy skin on these chicken thighs – perfection! The chicken with the creamy sauce sounds absolutely delicious! And I bet you can add different herbs to customize the recipe also. Oh, and that idea of mushing the soft butter and flour together – love it! I am definitely going to use this technique in the future. Thank you Julia! Love the mashed butter/flour technique – it guarantees a lump-free sauce! I used to work at Cracker Barrel, and this looks SO MUCH BETTER than the chicken and mushrooms that they serve! I love that golden skin you’ve got here, and the sauce looks amazing. I’m sure it’s delicious! I was just saying yesterday that I need more chicken recipes in my rotation. It’s so easy to get into a chicken rut! This recipe looks so comforting and elegant. I know what I’ll be making with the chicken and mushrooms in my refrigerator!